I am excited to share the kick-off a new monthly series with you all today on the Disney Parks Blog called “Sketches from the Park.” As a Disney cast member, my main role is creative advertising, but I am also a Disney artist with original work showcased in the Art of Disney galleries. As such, I love to constantly be learning new things with art. Recently, I have been going into the parks to do quick sketches on location. So, each month I will be sketching from the field, or Plein Air as it’s called in the art world, from a new inspiring location in our Disney Parks and then sharing my sketches and experiences here on the blog. 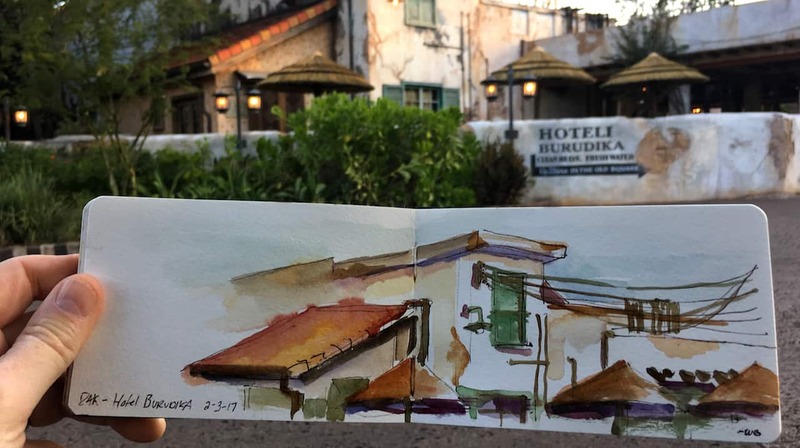 Today, I enjoyed an early morning session at Disney’s Animal Kingdom where I sketched Hotel Burudika. There was a fantastic light as the sun started to rise above Everest in the distance, and I sat here, near Africa’s Mombasa Marketplace. I sketched this piece using pen and ink, and a little watercolor. It was such a peaceful morning as I started to hear the birds and animals in the distance — it was like the park was coming to life around me just as I started to add some color to my sketch. What a great way to start the day and get inspired! I hope you enjoy the art and keep your eye on the Disney Parks Blog for my next sketch from a new location next time in our “Sketches from the Park” series. Will Disney be offering prints of your latest work? You have captured one of my favorite times in the park with the other time being twilight just as the lights come on. Will, I follow you on Instagram and am always in awe of your creations! I cannot wait to see the beautiful places you’ll capture in this series. I often sketch or draw when I visit the Florida property. It has been a wonderful way to meet and engage folks from all over the world visit the world. I plan to do so even more sketching when we relocate our home to Windermere this late spring perhaps we can meet up some day Will. In the meantime thanks for sharing and looking forward to seeing your future works. Love the idea! Maybe you have an artist friend in the West Coast that can contribute a sketch from Disneyland periodically? Just throwing it out there ? 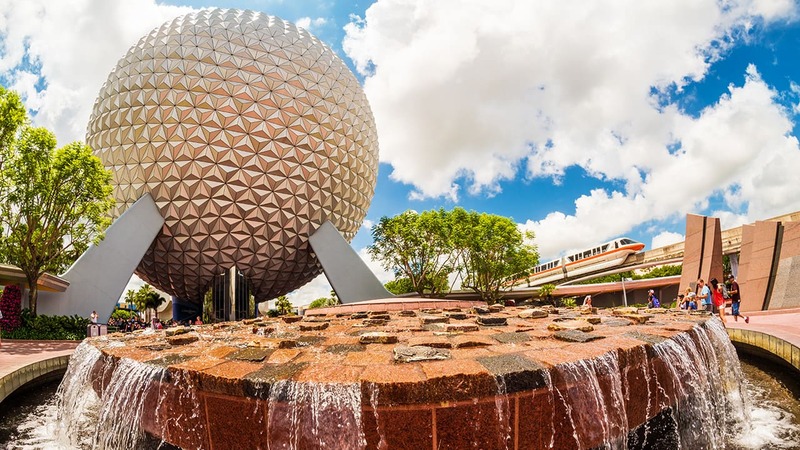 As a former EPCOT castmember I thoroughly enjoyed your description of being in an awakening park. It’s one of the things I miss most. I can’t wait to see what else you have for us and hope your sketches will become available in print. If only I had more time to just sit and admire everything, I would be doing the very same thing! What a great new series! Thanks Julia! Glad you like the new series. I know it’s hard to find time always but definitely worth it to get refreshed! Awesome. I’d love to see a giant collaboration of artists from all over Disney do this! That would be amazing, I would love to see that too! Thanks so much Adam. Can’t wait to do some more!